U.S. postal mail is going the way of the print newspaper. There is little, if anything, that arrives in your mailbox that is not a package and can’t be delivered to you faster, easier, and cheaper, via digital means. But it is still a governmental institution, and until Amazon can deliver your physical goods solely by digital printer and drone, the USPS remains a vital cog in the American dry goods supply chain. Despite Trump chest-thumpery to the contrary (and why should the USPS, of all entities, be singled out to be a profitable enterprise in this administration so recklessly running titanic deficits everywhere else? ), a USPS bailout would happen in an instant if the alternative was suddenly no more mail for anyone. The U.S. Postal Service could be headed for a bailout if budget woes are not addressed with significant reforms, argued an expert Friday. 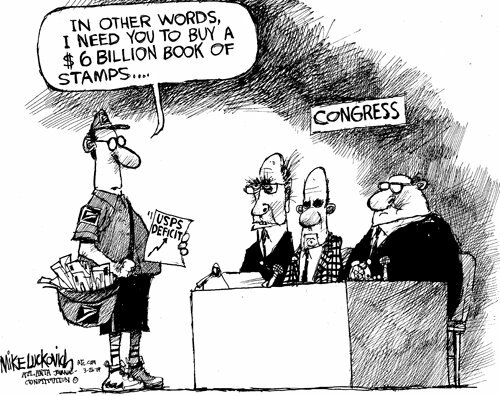 Congress has looked to address the budget problems with the post office facing $15 billion in debt. The United States Postal Service (USPS) has supported efforts to advance legislative and regulatory reforms to fix the budget shortfalls. But critics contest that the real issue is mismanagement. The U.S. Government Accountability Office found in a report that the postal service is facing $121 billion in total debt and unfunded liabilities as of 2016. Retiree health and pension benefits accounted for most of that expense. The outstanding debt alone is at the current statutory limit of $15 billion. The USPS releases annual and quarterly reports to highlight its budget and expenses. The last annual report marked the 11th year in a row that the post office had a multi-billion dollar loss. It reported a net loss of $2.7 billion last year and a net loss of $5.1 billion for fiscal year 2015. It also reported a $5.5 billion loss in the year before that.